Gold has always drawn people's attention. One always seeks to accumulate the amount of the noble yellow metal — a symbol of wealth and prosperity. Our first article is devoted to the oldest legends about gold. Being known for his deeds, Hercules was the son of the god Zeus in the ancient Greek mythology. Once he was obliged to get three golden apples from a magic tree which bore precious fruits. The golden apple tree grew in the wonderful garden of the mighty giant Atlas. Hercules deceived the giant Atlas and snatched golden apples, which he then brought to the altar of the goddess of warfare Athena Pallas. One of the most well-known myths associated with gold is the legend of King Midas, known for his endless wealth. Midas helped to save a life of the god Dionysus. In gratitude, Dionysus offered Midas any reward that Midas desires. So, Midas received a gift of "golden touch" — an ability to turn everything he touched into pure gold, including food and drinks. Greedy Midas realized that he had made a mistake. He begged Dionysus for help since he was afraid to die of hunger. To get rid of such a gift, Dionysus ordered Midas a deal: to swim in the waters of the Pactolus river. The legend says that after this had happened, Pactolus became a gold-bearing source. 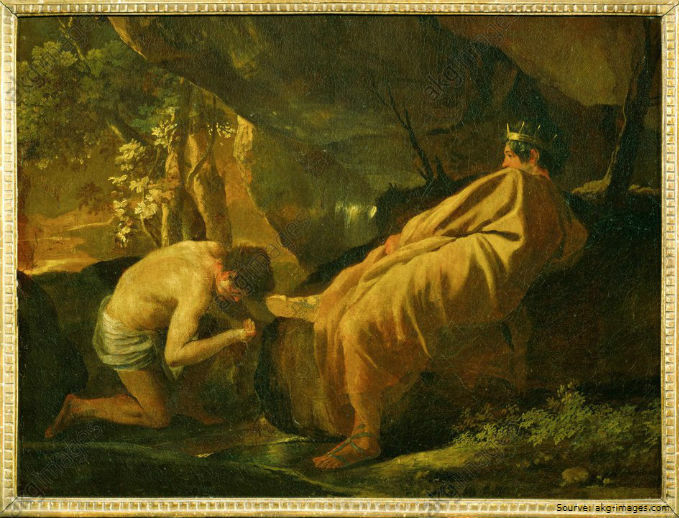 In the photo: King Midas at the source of the river Pactolus, the canvas of painter Nicolas Poussin, 1627. In the IX century BC, the Assyrian queen Semiramis ordered to make a statue of the ancient Greek goddess Rhea from pure gold. The monument was gigantic in its size. The mother of the gods of Olympus sat majestically on her throne, surrounded by obedient golden lions. According to the stories of the ancient chroniclers, the weight of the gold sculptural composition was 250 tons. However, traces of the existence of a precious statue have not been found. The most revered deity in ancient Egypt was the supreme god of the sun, the creator of the world and people. An ancient legend says that the inhabitants of the country erected a gilded 60 meters high statue in the honor of Ra. The long hair of the mighty Ra was made of pure gold. According to legend, the bird Phoenix is the soul of the god Ra. Having revived from the ashes, the bird greeted each and every sunrise on the golden top of the monument. It is still unknown whether the "Golden Ra" really existed or not. Cusco is the oldest Peruvian city. According to the legend, his founder was Manco Capac, the first Inca emperor. The beliefs of the ancient people were associated with the phenomena of nature and the heavenly bodies. The legend states that the Father-Sun and Mother-Moon sent their children to the earth. The son was given a golden staff and was ordered to build the city on the same place where the magic staff would penetrate the ground. Manco managed to plunge the golden staff into the soil of the fertile valley near Mount Wanakuri (southeast of Peru.) Children of the Sun gradually began building a great city there, which later became the capital of the richest Inca empire. The word Cusco, translated from the Quechua language, means the Center of the Universe or the Center of Peace. 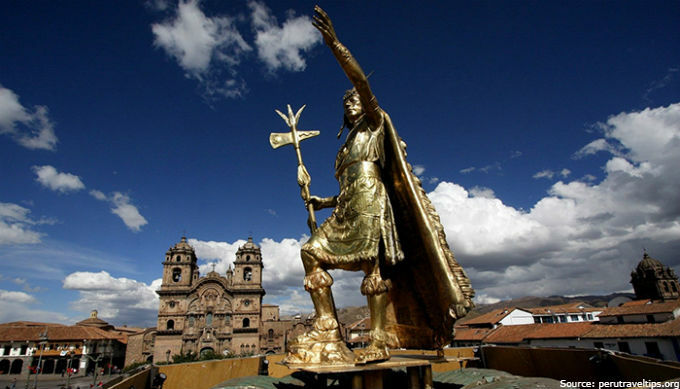 In the photo: a golden statue of the first Inca emperor Manco Capac in Cusco, Peru. Read about the legend of Eldorado, the rich country of the "gilded man" in the next article.